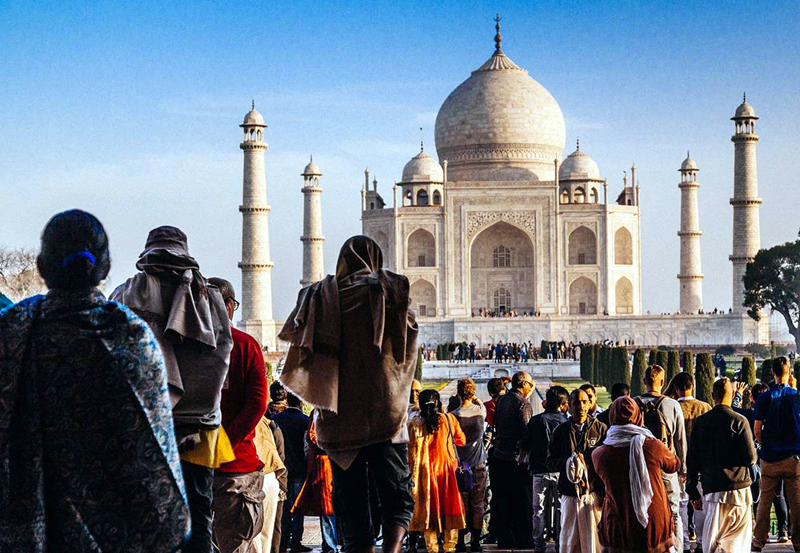 Indians make up the majority of the Taj Mahal's 10,000-15,000 average daily visitors. Authorities have hiked fivefold ticket prices for Indian visitors to the Taj Mahal, in the latest attempt to lower tourist numbers and reduce damage at the country's top tourist site. Indians make up the majority of the Taj Mahal's 10,000-15,000 average daily visitors. Nearly 6.5 million people marvelled at the white marble 17th-century masterpiece in 2016. An all-inclusive ticket for Indian citizens including entry into the Taj Mahal, built by Mughal emperor Shah Jahan as a tomb for his beloved wife Mumtaz Mahal, was raised from 50 rupees ($0.70) to 250 rupees. International tourists will pay roughly $19 to enter the UNESCO World Heritage complex in northern India, up from $16. "We want people to pay more to limit the footfall," an official from the Archaeological Survey of India, the government body responsible for upkeep, told AFP. "This will cut down the number of visitors to the mausoleum by at least 15-20 percent and generate revenue for its conservation," the official said. The latest move comes only months after Indian authorities restricted the number of tourists to 40,000 per day. Previously up to 70,000 people would throng the site at weekends. Experts say the huge flow of people is causing irreversible damage to the marble floor, walls and foundations. Officials have also struggled to stop the white marble from turning yellow as pollution levels rise in the northern city of Agra. Further damage is being caused by excrement by insects from the noxious adjacent Yamuna river, one of India's most polluted waterways. In July, India's Supreme Court threatened to either shut or tear down the monument over the failure of the authorities to protect it from degradation. The court asked the Indian authorities to consult international experts to speed up the conservation efforts.